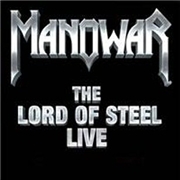 MANOWAR are set to celebrate highlights from their Lord of Steel World Tour 2012/13. The band has been around since the early eighties and is by no means new to anyone. Neither are they new to releasing live albums, and this is their fourth on disc/vinyl with a bundle of videos adding to the score. S without further ado, here are Messrs. Eric Adams, vocals, Joey DeMaio, bass, Donnie Hamzik, drums and Karl Logan, guitars, live on stage. First up, the sound is excellent, even in my earphones. Opener “Thunder in the Sky” celebrates their first Italian gig in 10 years. The call to arms is obvious, the masses respond amazingly and the stage is set. MANOWAR will never be masters of their instruments but they sure do master an audience, and the shaping of true dedication. But as an opener of this disc it is not the coolest choice. “El Gringo” was well received overall, not least in Sweden in March. The Spaghetti western genre gets a neat overhaul, which did surprise me, by these muscle men. “Expendable” offers more marching pace, and the effect on the wild Finns is laudable. The message is apparently received loud and clear. The final three cuts (out of six) are more favorites of mine. “The Lord of Steel” is the obvious choice, and it works great in Germany. “Hail Kill and Die” would set even the Vatican on fire as it si delisiously contagious. “Manowarriors” may have a slight overtone of the Smurfs, but is yet a height in the commercial journey of the band. I must say, when IRON MAIDEN departs, this will be the new number one formula of heavy metal, and it is getting to be a better and better sonic experience. Mark my words, this is a band on the perennial march to magnitudes.